A custom retractable banner or sign can be an important branding tool that could benefit your business for years to come. 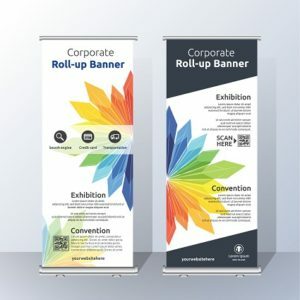 Retractable banners are especially important if your business is dependent on trade shows and other public events where you want to stand out. Here is a closer look at some of the benefits of retractable vinyl banners from CES&R Printing Services in Utah. CES&R Printing Services can provide you with a custom retractable banner in virtually any size. If you can dream it, we can build and print it for you. Nothing makes you stand out more at a trade show than a visually stunning 20-foot banner with a captivating message about your products or services. It adds an additional visual dimension to your trade show booth to catch the eyes of potential new customers or vendors. The amount of space required to store or transport a retractable banner is minimal when compared to a full-sized sign. Once the sign is retracted it can easily fit in the trunk of a car or in the back of a van for safely transporting it. A traditional banner stand is bulky and requires you to either ship it to a trade show location or transport it in a larger vehicle. CES&R Printing Services offers retractable banner printing from $4 to $6 per square foot, making it highly cost effective. A retractable sign is less likely to sustain damage than a traditional banner, adding hidden savings over time. We can also ship your finished banner directly to you anywhere in the world, for an added fee. Retractable vinyl banners are easy to set up and take down. One or two people can easily set up the supports, unroll the banner and slide or clip it into place. This reduces setup time for trade shows and reduces the number of staffers required for setup, which saves you even more time and money. A retractable sign can be taken anywhere and set up anywhere. It can be used indoors at a trade show or outdoors at a county fair display. It can also be used for sales presentations, business meetings and conferences. CES&R Printing also offers a lifetime warranty on our products, so your retractable sign can benefit your business for years to come. CES&R Printing Services in Utah can help with all of your printing needs including brochures, flyers, magazines, reprographics and more. CES&R also offers commercial grade printers for sale or lease, with zero percent interest financing available on all equipment. Contact CES&R Printing Services today to discuss your need for a custom retractable banner or any other marketing materials. All of our technicians are OCCEA certified and are ready to help you take the next step in your marketing and printing needs. We will contact you shortly in order to deliver the best possible price. Online requests qualify for a discount.